The 16th century was a turning point in the history of the Bible ; it was widely distributed due to the invention of printing. Humanism advocated a return to the original manuscripts in Greek or Latin for classical literature, and also to the original Hebrew or Greek texts for the Bible. 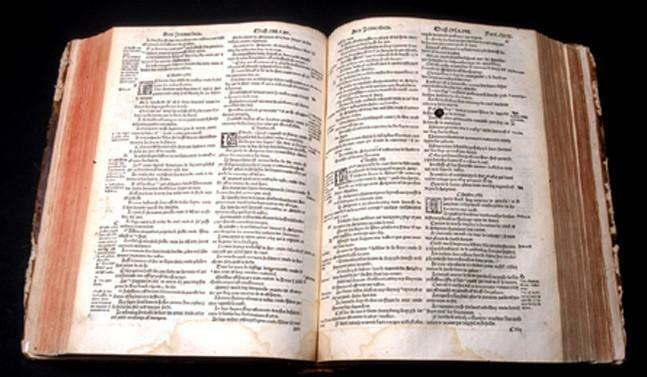 As the Bible was translated into the vernacular, it became accessible to more and more people. One of the first printing houses © S.H.P.F. The Humanists advocated a return to the original manuscripts in order to study classical literature without the errors which had been added over time. The texts of Greek masterpieces were brought to Europe. The Humanists studied these old texts, rediscovering the language, literature and philosophy of the Greeks ; in doing this they developed new methods of translation and commentary which they later applied to Biblical texts. 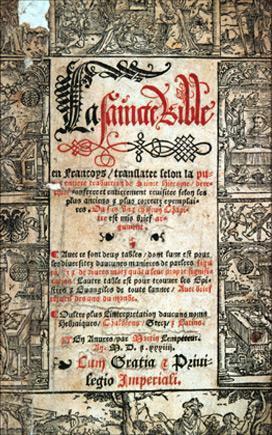 The success of printing led to the spread of their publications throughout Europe. 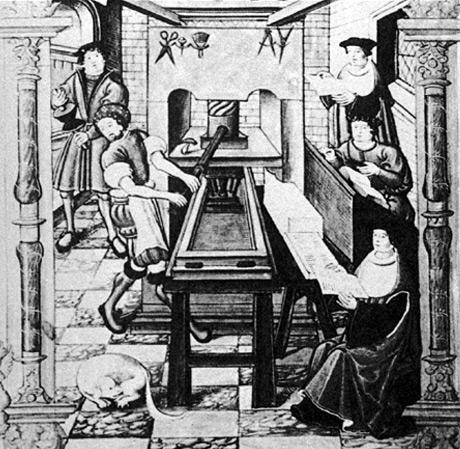 Indeed, it is in the printing workshops where these classical texts were published that Humanists would meet – this was encouraging for them as they were often living a marginal existence in the universities and sometimes they were hardly tolerated at all. The study of classical Greek and Latin texts, grammar and philosophy were the main activity of Humanist scholars. This would allow a different approach to Biblical exts in the future. Erasmus (1469-1536) was already well known as a leading Biblical Humanist. 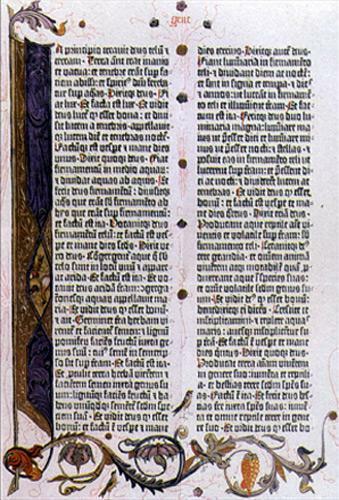 In 1516 he published a historic translation of the New Testament in Basel. For centuries, the West had only known the Vulgate version of the Bible ; this was the translation into Latin by Saint Jerome at the beginning of the 5th century. When the Greek manuscripts of the Bible were brought to the West in the 15th and 16th centuries, it became apparent that there were differences between the original texts and the Latin Vulgate translation. 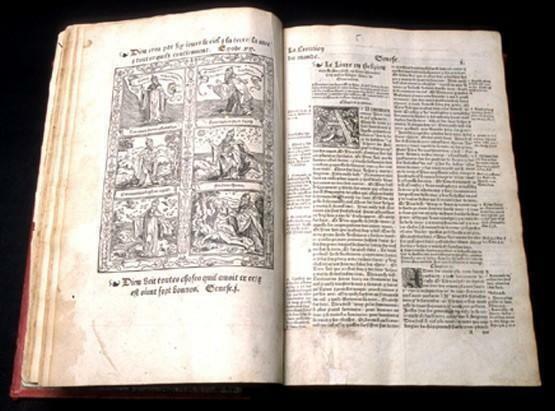 Erasmus’ edition of 1516, contained the original Greek text and a new Latin translation which corrected the errors of the Vulgate. Notes were published separately in a second volume, together with an explanation by the translator of his amendments. The author of this Latin translation was sharply criticised by traditional theologians, who considered the Vulgate to be a sacred text. Erasmus wanted translation into the vernacular so that everyone (including women) could read the Bible, but it was not in his time that this finally came about. However, his Greek New Testament was the basis of a large number of the translations into the vernacular in Europe in the 16th century. The Humanist Lefèvre d’Etaples (1450-1536), together with Bishop William Briçonnet, founded the circle of Meaux, which advocated preaching from the Scripture throughout the diocese of Meaux. In order to assist the preachers (who spoke French, not Latin), Lefèvre d’Etaples undertook the task of translating the New Testament into French ; he used the Latin Vulgate as a source text but made some changes in the light of the Greek manuscript. 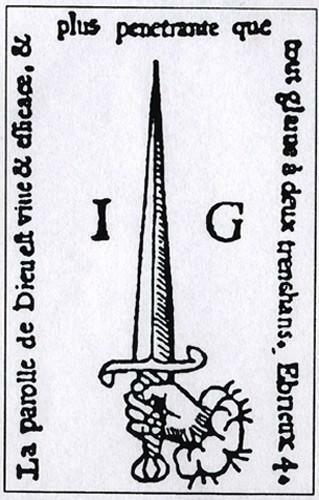 This translation, published in Paris in 1523 and 1525, was highly successful. However, it too received much criticism from the doctors of theology in the University of Paris, who, in 1526, called on Parliament to forbid any translation of the Scripture into French. 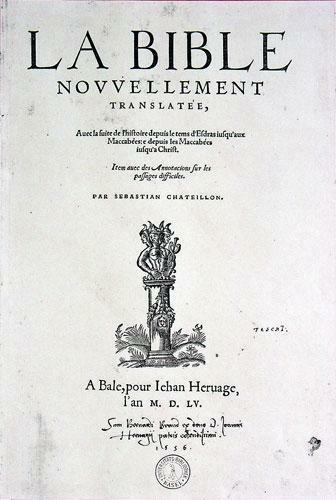 With the support of Marguerite of Navarre and Francois I, Lefèvre d’Etaples was able to take up his work again and to translate the whole of the Old Testament, although this time he had his translation of the Bible published in Anvers, with the support of the doctors of theology in the University of Leuven. It was revised several times and became a reference for over a century. As soon as he was appointed professor at the University of Wittenberg in 1512, Luther gave a Bible commentary for his students. He translated the New Testament into German in 1522, over 11 weeks while he was living in Wartburg Castle ; he used Erasmus’ translation as a source text. When it was published, this translation received great acclaim and went into 85 editions between 1522 and 1533. 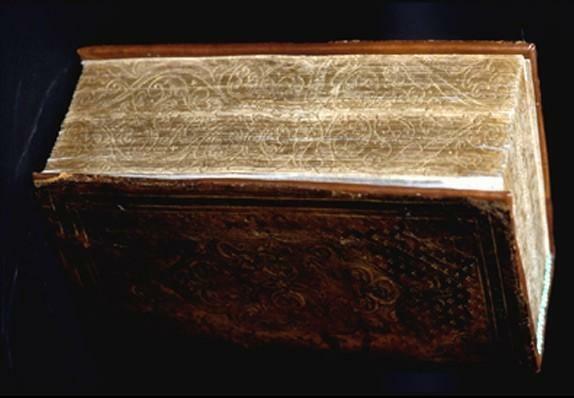 A group of Hebrew scholars undertook the translation of the Old Testament from the original Hebrew text and the complete Bible was published in 1534. In its prefaces, Luther called on his readers to study the Scriptures. His translation had considerable influence on the language and thinking of Germany. Apparently, Pierre Robert, also known as Olivétan (1506-1538), a native of Picardy, was a distant cousin of Calvin’s. He is known for his translation of the Bible into French, called the Olivetan Bible. TheWaldensians commissioned and financed this translation – they were Waldo’s disciples who joined the Reform Movement at the Synod of Chanforan in 1532. Some historians think that it was the French-speaking Swiss who encouraged this undertaking and William Farel in particular. It is thought that he persuaded the Waldensians to finance the project. 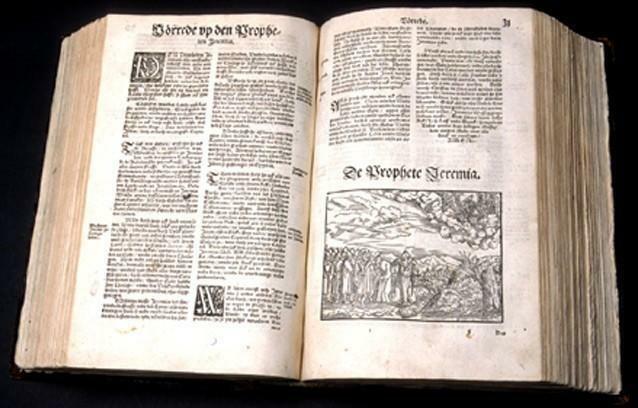 The Reformers in Geneva and Lausanne were keen to have a translation of the Bible into French which was not based on the Vulgate, but on the original Greek and Hebrew texts. They were looking for a good translator and chose Olivétan because he had studied Hebrew with Bucer in Strasbourg. It was an incredible achievement for one man to have translated the entire Bible in two years. 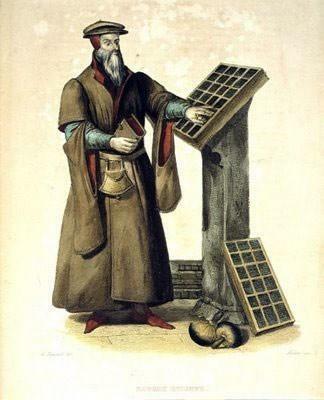 Indeed, he was a precursor of future translators, as his translation was the first to be based on the original Greek and Hebrew texts, although he did consult Lefèvre d’Etaples’ translation of the New Testament as well. Unfortunately, his translation of the Bible, published by Pierre de Vingle in Neuchâtel in 1535, was not a commercial success. This was partly because of the Gothic script and the fact that it was a large book, so difficult to handle or take around. 1744: Revision by John Frederick Osterwald. The humanist Sebastian Castellan (1515-1563), had a good knowledge of Biblical languages. He wanted to make the Bible accessible to common folk, rather than to the educated few. For this reason, his translation was made into everyday French. 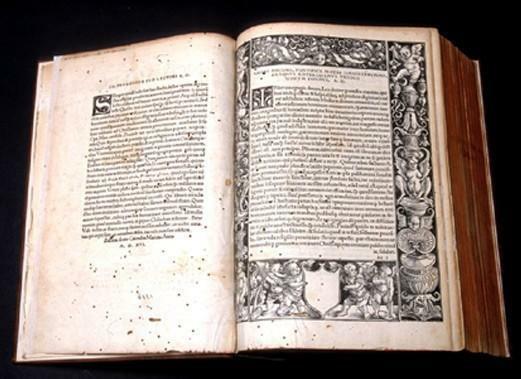 His translation, printed in 1555, was too revolutionary for his time and shocked many people. It was thought that as he had used the “jargon of the common man”, Castellan was not respecting the majesty of the Bible. His translation appeared too modern and was not a commercial success. However, his idea of translating the Bible into the language of his time would be taken up in the 20th century when a translation was brought out in modern French, accessible to the average reader and it went into a great number of editions.